Honor your souls purpose. Claim the destiny that you know is yours and act on it now! In this case, whale symbolism is reminding you that you cannot know or understand everything. Thus, there are things that you must accept through the heart, senses, and intuition without the knowledge and understanding of why. In other words, whale meaning is asking you to have trust and faith in your hearts desires, and in so doing allow it to lead you to your destiny. In the case of Humpback Whale symbolism, it brings you a message of good fortune through creativity. Thus, like the sea turtle, you must not give up on your current creative endeavors because success is close at hand. Alternatively, the whale meaning is reminding you that you must sing your song through life. Thus, as you choose your way, separate from the choices of others, you will find your fulfillment and purpose. Yours is a path of individuality and the ability to do things in your unique way. When Blue Whale symbolism appears to you, there are always big things happening in your life right now. However, this creature is reassuring you that although things feel overwhelming right now, these changes are necessary. Thus, you need to stay focused and connected to yourself so that you can work your way through to resolution. In other words, Blue Whale symbolism reminds you to have faith in your abilities and allow yourself to be still enough to see the way. In this case, Sperm Whale meaning is a reminder that you have vast untapped resources within yourself. In other words, like the seagull, you have all of the tools and abilities to acquire your dreams no matter how far off they seem. All you have to do is engage in the process. When you participate in manifesting your goals, your intentions become apparent to the Universe. This clarity is when the magic happens. Through faith, trust and action, the Universe will aid your journey. In other words, Sperm Whale symbolism is letting you know that you have the power, so don’t be afraid to use it. Alternatively, Sperm Whale meaning is a reminder that you are free to make your own choices in life. Thus, your uniqueness should choose a path that is right for only you. It doesn’t have to be a conventional or direct path, just one that works for you. The pilot whale symbolism is a reminding you that your path is unique and that even though it feels lonely, you do have help and support along the way. Even in the darkest of moments you are being helped and guided. Like the kangaroo, all you have to do is choose to keep moving forward. Alternatively, Pilot Whale meaning is letting you know that you are not as lost as you think you are. Sure, you have lost your direction somewhat. However, it will be easy to get back on course. All it will take is a few small steps in the direction you think you should be going, and the way will become apparent to you. In other words, all you need to do is prove that you still want to get there. When the Beluga Whale meaning makes an appearance in your life, it is reminding you that your best friend is yourself. In other words, the spirit whale is asking you to be kind to yourself and embrace yourself as you are. Nevermind all of your self-perceived faults and criticisms, just let them go and unconditionally accept yourself. Take the time to look at the beautiful person you are inside and out. When you love yourself, everything else will fall into place. Alternatively, the Beluga Whale Symbolism is letting you know that you must embrace others as they are as well. There is no need to change everyone and everything to suit your taste. Thus no one has to be what you expect them to be. All they have to do is be themselves. Occasionally Beluga Whale meaning brings a message of peace and harmony in your environment. What was once stressful will now dissipate and become harmonious. In this case, Narwhal is reminding you that everyone is unique in their way. Even if you look the same and dress the same as your friends, you are still different. Therefore, you must make your decisions in a way that is right for you, and you only. In this case, Grey Whale meaning is reminding you that the goal you have set for yourself is not as far off as you think. In other words, change your perception of time and distance to achieve your goals. When you believe that they are closer to you, then they are. If you keep thinking that they are so far off that it will take a long time to achieve them, then it will take a long time. Time and distance are only minimal obstacles in the bigger picture of things. People with the Whale totem have a deeper awareness of the world around them. They also have a profound connection to the cosmic consciousness. Folks with this spirit animal recognize that what they see, is not necessarily the reality of what is. Thus they are easily able to bridge these differences and integrate all things into the truth of what is. People with this power animal are very nurturing and have substantial ties to their community at large. Often they are the movers and shakers passionately standing up for what is right locally. Like the spider totem, these folks love to get lost in their creativity but often have to find a balance with this world and the real world. People with this spirit animal totem are exceptionally good at musical expression. They enjoy socializing with others and tend to move with the climate so that they are warm in winter and cool in summer. Although these folks love to be social, they are also independent. Thus they will spend a fair amount of time alone. Folks with the Humpback whale totem are also powerful communicators and are good at expressing complex theories clearly. People with the Blue Whale totem have an impressive presence that makes people notice them immediately. They are intelligent, insightful, compassionate, and generous. These folks are always willing to listen or give a helping hand to a friend. They also enjoy any vocal expression. People with the Sperm Whale totem are highly creative in all ways. Thus the need for them to express their creativity is so overpowering that they will often become lost in it. Consequently, they end up leading an unbalanced life because their passions consume them. However, once they learn how to integrate balance into their lives, they are happy and social people. Folks with the Pilot Whale totem, like the angelfish, love to give help and guidance to others. They are patient listeners, compassionate towards others and themselves, and highly social. These people love to be with their peers and form a very close-knit group of friends. Their most difficult challenge in life is to act and think for themselves because they tend to follow the crowd. People with the Beluga totem are incredibly social, and enjoy lots of company and entertaining. They are also adventuresome, enjoying group tours to strange places. Their active imagination continually turns their ideas into physical expression and manifestations. They are playful, balanced, deep thinkers that love to play harmless practical jokes. Folks with this spirit animal totem can heal others with their voice. Like the Beluga, people with this spirit animal totem are very social. Like the penguin totem, they understand the power of teamwork and love to work in this way. These people also have a passion for using the best possible tools to get any job done. People with this spirit animal totem are strong-minded, have a great deal of stamina, and will always get the job done. Their peers respect their opinions, and they will readily participate in any debate. In other words, these people love to use their voice, whether it’s for their cause, or for healing and song. These folks are empathetic activists and will usually be involved in many movements. They are also willing to travel long distances to stand up for those causes. When you have a whale dream, it can represent your intuition and awareness. In other words, you are in tune with your sense of spirituality. Alternatively, a whale symbolizes a relationship or business project that may be too big to handle. Thus you are feeling overwhelmed. When this animal appears in your dream, it symbolizes the need for curiosity. In other words, like the hedgehog, you must experiment with new ideas to break free of your present stagnation. When you have a Blue Whale dream, it symbolizes that the problem you are currently facing is not as big as you think. In other words, use your creativity to find a simple solution. When you have a Sperm Whale dream, it is a reminder that there are no limitations to your creativity. You have all of the resources that you need to achieve the goals you have set for yourself. You have all of the resources you need to accomplish the goals that you desire. Alternatively, this mammal is reminding you that you must remain creative to complete your goals. Using your creativity will speed up any process toward any goal you have right now. Stop hesitating; the skills will come as you progress. When you dream of a pod of these mammals, it is a signal that group efforts are potent forces in creating what you desire. However, you must engage your unique gifts to the endeavor for it to be successful. Alternatively, a pilot whale dream is a reminder that you must balance your work, play, and family life. In other words, you should give all things equal attention so that you will feel balanced. When things become unbalanced, you will feel out of sync and off-course. A beached animal of this species is a reminder that family and friends are important and should be supported, however, following along blindly can and will get you into trouble. Thus you need to find new ways to be supportive, without compromising yourself. When you have a Beluga dream, it is a message that you will soon integrate a new spiritual understanding into your life. In other words, be open to receiving a new spiritual lesson. When you have a Narwhal dream, it is a specific reminder that it will take dedication, focus, trust, faith, and magic for you to achieve your goals. Each element is compelling on its own. However, when you combine them with gratitude for what you have already accomplished, that is when the magic happens. Alternatively, when you dream of this animal moving on a direct course, you are being pointed in a new direction. Thus, Spirit is asking you to make a small change in your path that will be of benefit to you. When you have a Grey Whale dream, it is reminding you that although your visions may seem out of reach, the reality is that they are much closer than you think. In other words, everything is always within range. It is just a matter of perception. Alternatively, you are being challenged to look inward to see what is keeping you from successfully reaching your goals. In other words, permit yourself to succeed, dig in and finish things up. You are too close to give up now. Greetings, I call myself Artweaver. On February 3, 2018 I became conscious in a most incredible and unforgettable dream. In this dream I percieved myself to be in the mouth of a great whale. I stood upon the tongue, near the front of the mouth, next to the rows of baleen. I looked around and could clearly see the inside shape of the mouth, but no surface was made of flesh. It was made entirely of stars and galaxies. I looked at my hands and body and saw that I was also made of stars and galaxies. I remeber thinking, I probably seem camoflaged, as both our forms were made of the same light, the same stars. I noticed movement in the throat and when I looked away from my palm up, star filled hands. I saw two large illuminated orbs that were made of solid light blue materlial. One orb lowering from the roof of the throat, the other coming up from the back of the tongue. They made contact in the middle and the most amazing thing I have ever wittnessed occured. At the instant and place of contact, I heard the whales song and saw millions of rays of light shoot fourth in my direction and pass through me. As they passed through me I saw, between each ray of light, a random human life. I awoke amazed and confuzed. Since then, I have reached an enlightened state of meditation twice. Both times were unexpected. I sat or lay in infinte blackness, the first time, and sensed I was being observed by multiple entities. I recieved a feeling of farewell, then I started to cry, and I recieved a magically warm embrace. The second time, I was simply sitting down, resting at work, and I was smoothley pulled into the infinte blackness again. I was approached by a lone entity and recieved another magically warm embrace. I awoke and was stunned. I now wear a fine metal bracelet on my left wrist and a waterproof watch on my right wrist and i have no ideah why. I like them, but I cant make sense of any of this. Last night I had a dream that was more vivid or should I say more memorable than most. Very weird, but I found myself in what I think was my ex girlfriend’s house, we broke up almost six years ago. The break up was ugly, and I know I hurt her, but we were able to talk a few months after the breakup and I believe we found some peace. Anyways, I haven’t talked to her since then and last night she was in my dream and like I said I’m pretty sure we were at her house. I’m not sure exactly how it happened but I found myself at her back window overlooking the ocean and within seconds a whale swam up to the window inviting me to reach out and pet it. Shortly after this whale swam away another whale (this one was much bigger) did the same exact thing. It was almost if I was communicating with the whales telepathically or something bc we felt so connected and at peace, almost like I had known them forever. I don’t what to make of this because I’ve never pet or seen a whale in real life or a dream and I haven’t talked to my ex girlfriend in a pretty long time. Anyways petting the whales was literally the coolest dream I’ve ever had and I seriously hope I can see a whale in real life because of this. I had a dream almost exactly like yours! except i was in the water with them (near the shore). It was so peaceful and powerful, when I woke up (an even today, probably a year or so later), I can still feel the emotion of it. Whale, Ohswakaront, calls to each of us of honoring your Soul’s history and of giving your Spirit the full voice that it deserves. The song of Ohswakaront is the song of the freed Spirit. The voice of Ohswakaront is filled with the Skennen’kó:wa, the Great Peace of the Universe. It is only when we are in touch with Skennen’kó:wa, with the great peace, that we can hear the voice of our own Souls. We surround ourselves with noise and with tumult and we place our priorities on things that if we were to stop and listen, we would know instantly are not things that actually matter. But if we stop and listen, if we hear the voice of our true Spirit and if we give it full voice, then we can no longer hang onto those distractions that we have built our lives around. Each of us has to first ask what investment we have in those distractions, and why that investment matters so much to us. Ohswakaront calls for us to hear the sound of the Spirit, to remember the voice of the Soul. And we begin to do that by being still, by being silent. And then Listening. I don’t know that I’ve encountered Whale, Ohswakaront, before this time. I know that it speaks of honoring your soul’s path, which is the very thing that I’ve been working on for some time now. I’ve struggled along a pretty rough path, a very rough path and, sometimes all that you can see is your struggle and all that you can hear is the voices of hurt and anger inside of you. But there always more there. Sometimes it is as large as a Whale, and you have to allow it to surface to breathe. Sometimes this thing can be so large it terrifies you, but it might be so large because it is something that you need to see and to listen to. Whale, Ohswakaront,is that largest part of my spirit that I am not acknowledging in an open and truthful way. It is time for me to allow it to surface. I’ve had this dream before in my childhood, I was at an unknown house yet it was very familiar to me. I was out in the from of the yard when I’m not sure if I heard something that caused me to look up or not, but I looked up to the sky and saw whales swimming in the sky. I was so shocked and amazed, I still don’t know how I truly feel about it. I wasn’t afraid or anything, just full of amazement. Next thing I know, I was looking up and saw a crescent moon and it suddenly splits into 3 different moons and falls as if it were a shooting star. After that happened lots of other moon type orbs started shooting from the sky and one hit me on my right shoulder. It didn’t hurt, it was a cool sensation but I was still nervous so went into the house. I felt like I needed to save someone. Then the continuation of another that I’ve had before began. A guy whom I don’t know had a brother who was a police was attempting to set him up but I had to lie to him so that his brother didn’t get him killed. He was upset with me, but he ended up forgaving me and we continued whatever work that we were doing. Then I was awakened by my family. I dreamed I was at the bottom of the ocean. it was a clear blue. I was on the sand with a blue whale in front of me. We locked eyes and I knew I just had to hold me head up and I would float to the surface. The whale kind of nodded at me like now, go, and I did and I pushed off the bottom and rose to the surface. As I was rising i saw golden bubbles supporting me and when I broke the surface, I breathed in golden light. I woke up in the middle of the night because I’m pretty sure the universe wanted me to remember it. I’ve been going through a rough time lately and I woke up and felt – and still feel -that I have nothing to worry about. I dreamed last night that I was on a small boat in the middle of the ocean somewhere. I saw a whale tail flip out of the ocean right beside my boat. It was grey and one fin was bent down. I then heard it call out to me so I responded in whale frequency somehow. I was then rocketed straight up into the air. I looked down and the ocean was far below me and I felt fear as I started to fall back down. Everything started rushing by me and I had a thought that this is a dream and I don’t have to crash. I was then back in the boat and I heard the whale all out to me again but I didn’t want to be thrown in the air again so I responded in a lower frequency tone. I don’t remember anything after and my alarm went off but I woke up upset and irritated. My energy was buzzing almost to a point of anxiety. I do not feel rested. After my family left this morning I broke down and started crying for no apparent reason. I usually do not wear the color orange. This morning I grabbed a bright orange shirt that is normally reserved for when I don’t do laundry. So my Sacral is obviously out of whack. It has been a few hours now and I still don’t feel like myself. I know whales and dolphins bring messages. This one has left me with a lot more questions than answers. I dreamt I was on a boat and a whale came jumping towards the boat. at first I was scared but then it landed gently on my lap and looked in my eyes, it was smiling, it had chosen to come to me. I stroked it and felt such amazing love. The whale then turned into a man who was helping me to develop my intuition. He knew a lot about me but I didn’t know him or so I thought. it was then I realised that this was a dream and I said to the man “you could only know so much about me if this is a dream. You are my spirit guide aren’t you?” Then I was awoken feeling amazing and longing to go back to see my shapeshifter dream guide again. I have asked to meet my guide in dreams again. I feel he was helping me to become a lucid dreamer to develop my spiritual understanding on a new level. I dreamt that I was releasing a golden sperm whale to be with its brothers and sisters of Mother Earth. I woke feeling peaceful and purposeful toward my next direction. I dreamt i was on a boat. Sitting on the back of the boat. There were were hundreds maybe thousands of grey whales around the boat. But i was calm and it was peaceful and beautiful. Breathtaking. This dream stood out to me but i am not sure what it means exactly. Who can help?? I had a dream that I was free diving in the ocean, and a few humpback whales started imitating me, and then we continued to play and have an amazing experience, until one of the whales flipped a boat full of people and they all died. Then I was immediately blamed for everyone who died. 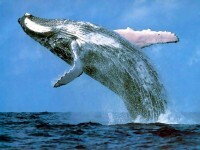 I have dreamt lots of Whales Playing / jumping and lastly mating! I dreamed I was on the beach with pack of humpback whales resting close to shore. I could only see its tails waving back and forth above sea level in the sunset. I sat and watched as people would walk up right up its tail and become completely wrapped up inside like a cocoon. Theyd be toughsed back and forth before being sling-shot into the ocean. i dreamed that i am in a ball of air maded with my powers and drifting in the deepthts of ocean where nobody ever explored while going down the big whale was next to me and i felt very good and strange feeling and then i woko up nice yeaaaa! I dreamed I was on a pier at night, looking for something lost. I was very sad. A huge whale was searching for the same thing that I was. He invited me to look far out in the ocean so I climbed onto his back and rode out in the moonlight. His back was wet and covered with barnacles and it was so cold. It smelled like salt spary. I had nothing to hold onto but he kept me balanced just above the water. I couldn’t see very far. I wasn’t sure what I was contributing to the search or why I was there. I felt scared that the whale might dive down and abandon me, and I would die. But it was also all so breathtakingly beautiful, the moonlight made the black waves shimmer like millions of stars. And the whale swam fast and the air blew around me. I felt special to have a whale take me for a ride. I felt special to have something in common with a whale, even if it was our loss. I dreamt I Swam on the back of a whale, I was quite frightened and wary in fear that it’ll drown me so I asked it to not get me too wet and get me to shore. He did as I asked. I then daringly starting to touch and stroke his skin. He felt wonderful, it felt like we connected through my touch. He knew exactly how I felt so I calmed down and we kind of hugged. I’ve never seen a real whale. The dream felt wonderful I felt a tremendous amount of peace just holding him. Then I had to leave the rest of the dream was action packed and driving my car on one wheel saving people. But that particular part of the dream was quite something else. I had a very similar dream last night. I dreamt I had a long distance to travel and a swam/flew across the surface of the dark ocean, next to/on the back of a pilot whale. We traveled very fast and I knew from the moment I was with the whale I was safe. It was a calming yet strong force and being. I could finally see the beach and knew I had to get there. The whale then carried me on his back faster than ever before and I was able to stand up while the water made waves around us. We arrived to shore and I went to get some food to feed the whale. I wanted to make sure it was healthy lol I went and got some food and brought it back, the whale opened its mouth and it already had a bunch of uneaten, unchewed food on its tongue. I added my offering and it accepted it. I then pet it smooth, shiny, silky skin right behind its eye on the top of its head. It received my touch and I felt a lot of peace and gratitude for our experience together. I then went on to tell the story of my whale experience like it was a dream, while I was still in my dream!! I woke up and immediately looked up the whale spirit animal. It’s messagw is right on time. THANK YOU TO ALL THE WHALES IN THIS PHYSICAL REALITY AND THE DREAM REALM. Thank you for your powerful and peaceful presence, your strong help and gentle nature. I dreamt of a beached beluga whale, it was being eaten alive by a shark, the shark was feasting on the belugas head, and eating the whale though the whale was still breathing, awful and horrifying, what does this mean? i dreamt i was swimming underneath a huge blue/green whale and looking up at it and seeing its tail coming down and ducking thinking it was going to hit my head. I did this repeatedly. There was a man swimming a small distance away. This was deep under the sea. Great reading all your xperiences and dreams. For the first time ever, I had a dream last night that I wanted to see or was given the opportunity to ride a humpback whale. I remember getting on and being in the water and waiting for it to start moving. I remember being pushed back a little as it kicked up speed. I remember thinking “wow this is exciting but A LOT faster than I had imagined!!”. I continues the ride and it was fab but then I remember being terrified of drowning or losing balance when I tried to dismount. I was scared because I didn’t know if the force of the water was going to take me under if I jumped off but anyway, whatever happened I was completely safe and the beautiful whale swam off. I can’t remember feeling any particular emotion when I woke up. Not happy or sad, just curious as to what it meant. One day I was at the helm of my trimaran sail boat. My husband and a good friend of ours were down in the galley playing chess so I was alone outside. All of a sudden I saw a GIGANTIC eye rise up through the water looking straight at me. It was a blue whale, the largest of all whales. It was so close to the boat that if I stood on an outer pontoon I could have touched it. I quickly ducked my head down into the galley and told the guys they had to come up and see something incredible. They did so immediately. The 3 of us were in complete awe and amazement as the whale swam along with us. Blue whales would not intentionally do anything to harm humans, but we realized that if the whale got too close to the trimaran it could flip the boat over and there is no way for a multi-hulled to self upright. We would have been in the water out in the ocean with no way to help ourselves to safety. The whale seemed to understand our excitement to be with it and yet sense our concern. It swam further out from the boat but stayed right along side us for several miles. It was wonderful. Zoe, your dream is the most similar to the one I had last night. I also dreamt that I swam alongside the biggest, strongest and fastest Blue Whale for several miles. It felt so wonderful to me too. Have you worked out the meaning to your dream? I agree… I dreamt of a white Buluga and a killer Orca last night. The white was female and the Orca was male. I recently took a trip to Maui where the whale season was peak. It was quite a remarkable week spent with a lot of auspicious connections. Upon my return, I have had 4 whale dreams in one week. They have all been very clear on some level for me to see them. I’m fascinated. In reading many angles all over the internet, the animal totems seem to resonate more. If anything, I am clear to access something within me using sound. I really get it. It will be fun to watch it unfold. Thanks for your take on it. Every once in awhile I have a dream with a whale (humpback/grey whale) where I have a brisk encounter and then it dissapears but it leaves me with this sense of peace and awe that is hard to describe in words…for example last night I was by the ocean and I was looking out to the water and there were whales visible by the shore; so close I worried for them that they might be in danger…I quickly headed out to the water and when I got there, the ocean had turned into a massive open tank aquarium. I jumped on a platform buoy and reached my hand out over the water and just as I did that a massive shape in the water started coming towards me, lifted head from the water and touched my hand with it’s nose, it did that more than once, but I can’t remember if it was 2 or 3 times.. It was a beautiful humpback or grey whale…Then as soon as the whale dissapeared I saw the horror of what the aquarium was; there were ANGRY and crazed killer whales and dolphins swimming and hitting the sides, trying to escape. I angrily spoke to the managers about how wrong it was, but my words fell upon deaf ears…anyway in my experience; the feeling in dreams associated with grey/humpback whales is positive, awe-inspiring beauty (atleast for that instant.) The feeling associated with killer whales in dreams is always deep sadness and loss, and a feeling I must help them in some way. The whale dreams started happening after an ecounter at sea world where I was chosen out of a crowd of 100’s to come down and sit atop “free willy’s” back. Of course I was elated at the time, being a small child, the connection with whales has never left me. First of all thank you for this information, it has helped me to understand what I am going through right now. The first time I dreamt about a whale was during a lucid dream where I like to just fly around and make the terrain as beautiful as I possibly can, but then the dream turned on me, I stood before a vast expanse of darkness which I discovered was the ocean. Usually when I encounter water in my dreams and if I am lucid I love to plunge in and breath under water but this water did not let me in, it was scary and I almost didnt want to dive in. I began to think of what might lurk beneath the waters and quickly caught myself lest I conjure up a huge man eating shark. Then he appeared, a large blue whale right underneath me, I was a bit scared at first but then the thought of riding on the back of the whale was exciting so I went with it. It dived and I felt myself go under but not too deep before it resurfaced and dived again. I felt safe on his back and I felt as if he was protecting me from the darkness below. I woke up then and wished I could stay a little longer. The second time the whale came to me was today in an afternoon nap where I usually can be lucid if I choose. The dream starts like any other with me realising I am dreaming and then I immediately go outside and take off to fly around. Again the ocean was before me. I saw the whale waiting for me so I went to him and landed on his back. Immediately he leapt for the ocean which was barred by 2 large storm drain gates. The whale crashed up against them to try to break through and I noticed the latch which I opened and the gate swung open and he leapt through to the next gate, again without hesitation I opened that latch and we were in open water. I was carried to a place streaming with fish, so many fish there was hardly space for the water in the sea. We dived and I felt the fish all around me, large and tiny fish. As we were going down I felt my mouth catch some of the tiniest fish and I tried to get them out. The journey took me to a place where I got off the whale and went to visit someone, it was an odd encounter but when this person saw the whale he wanted to catch him and put him on display. I would not have that happen so I raced to my whale and fought of the swarm of people now all trying to catch him, I carried my now much smaller whale to the ocean and then he was big again and we raced “home” we were safe so I bade him farewell and then woke up. When the whale appeared to me the second time I decided to look up what it meant and I am glad to have found your post, thank you. I don’t know why, but lately, I’ve had two dreams with whales. Both terrifying because I don’t like to swim with fish, therefore I don’t like being in the ocean. The first dream the whale was huge, with a blow hole that could make a whirlpool, on top of that it was poisonous, yet harmless. The second dream, I had to be the whale and try to live as a whale, but I was completely dysfunctional and couldn’t swim no matter how I tried. I tried to use echolocation as the whale…also failed haha. The scariest part was there was a shark that snapped at me. I couldn’t swim away, then I woke up. Then the word whale would come up in my waking life as well, too many whales, I don’t understand.